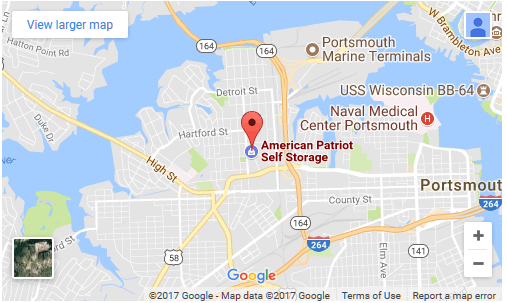 American Patriot Self Storage is conveniently located just by the Broad Street Post Office in Portsmouth, easily accessible from the downtown and midtown areas of Portsmouth, the Midtown tunnel and I64 and 164 freeways, Norfolk, and Chesapeake. Our site is fenced and lit, with professional management for most of access hours. We offer digital video surveillance and the premises is monitored by a local security company after hours to give you peace of mind. We provide you with your own individual code for use with our controlled gate access system, for secure entry 6am- 8pm, 7 days a week, for most lockers. Gate Access is 6am- 8pm, 7 days a week. All major credit cards are accepted, as well as personal check and cash, so making a payment is easy. You can use convenient auto credit /debit charge or checking account billing to pay your bill monthly. Our E-commerce software gives you the convenience of accessing your account online, so you can pay your storage unit’s rent from the comfort of your own home. New customers can reserve a unit online, and existing tenants can view account history and payment history through our secure connection with only a few mouse clicks. We strive to offer the best prices in the area at our storage facility, and we GUARANTEE your move-in rate for 12 months. With hundreds of units in a variety of sizes, you’ll be sure to find something to suit your storage needs. To be sure you get the best deal on your unit, check out our size guide and pricing considerations.